Barbara Janta is a Senior Analyst and Nadja Koch is a Research Assistant at RAND Europe. Harry McNeill Adams was a research intern for RAND Europe in 2018. In a recent policy memo on family-friendly workplaces for the European Platform for Investing in Children, RAND Europe researchers found that many families in the EU still struggle to balance their professional and domestic responsibilities. Our analysis was based on 2016 European Quality of Life Survey data. Several factors can create tensions between work and family life. Working schedules are increasingly long and unpredictable and many employees still face relatively low levels of flexibility in their working hours. Also, childcare arrangements can be inadequate and may not meet the needs of working parents, in particular women. Negative consequences of the work-family conflict include missed family activities and difficulties in picking up children from school. Researchers have argued that this conflict does not only interfere with the personal wellbeing of employees but may also affect their work performance and commitment. So it should be in the best interest of employers to be aware of the potential for work-family conflict as well as possible ways to reduce it, such as flexible working hours or working from home. So how does the situation differ across Europe? More than one-third of respondents from across the EU said they found it difficult to combine paid work with their family responsibilities. The share of respondents that reported that it was “rather difficult” and “very difficult” to combine paid work with care responsibilities ranged from 20%in Ireland and 22% in Estonia and the Netherlands to 58% in Croatia and 60% in Greece (Figure 1). 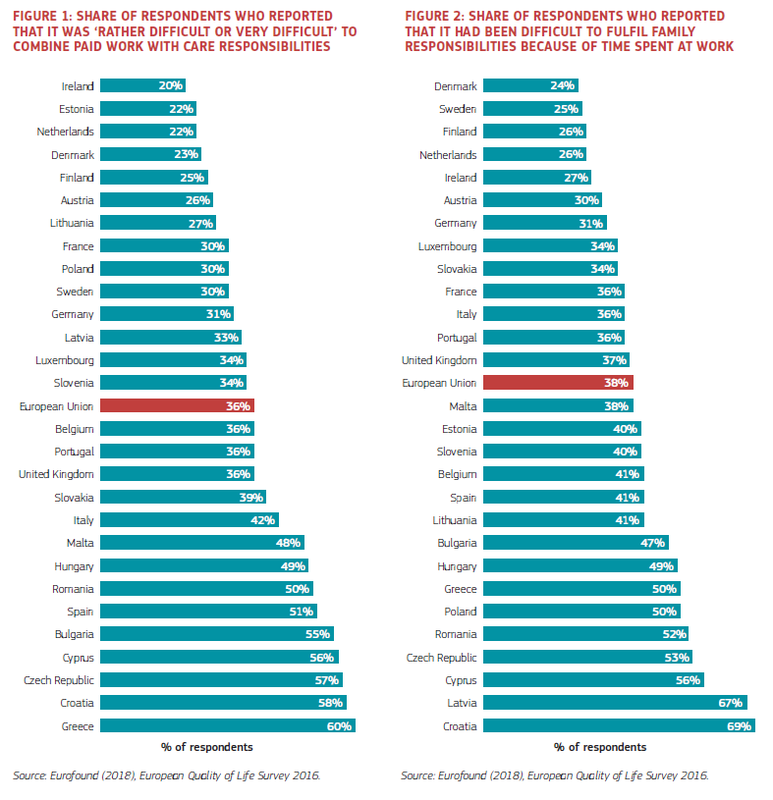 Similarly, there were also massive differences between the shares of respondents in the EU countries who reported that it had been difficult to fulfil family responsibilities because of work. Only one-quarter of respondents raised such concerns in Denmark, Sweden, Finland and the Netherlands, compared with nearly seven in ten employees in Latvia and Croatia (Figure 2). Despite the benefits associated with flexible working, the majority of employees in most EU countries still do not have flexibility in their working hours (Figure 3). Most working time flexibility is experienced by workers in the Nordic counties, such as Sweden, Denmark and Finland, as well as by workers in the Netherlands. On the other end of the spectrum, workers in Central and Eastern European countries, such as Hungary, Romania, Croatia, Slovakia, Lithuania and Bulgaria, as well as some Mediterranean countries, like Malta and Cyprus, were most likely to lack such flexibility. While the 2016 European Quality of Life Survey data paint the overall picture of the situation in the EU countries, analysis of Britain’s Healthiest Workplace survey data provides a more detailed national-level overview of the situation in the UK. Analysing the 2017 survey data from 31,950 employees of 167 organisations across the UK, RAND Europe researchers found that working parents have more flexibility in the workplace than other workers. Of 8,436 respondents who were responsible for the care of a child below the age of 18, 62% had an option to use flexible working hours. This compares to 53% of employees without carer responsibilities who had the option. 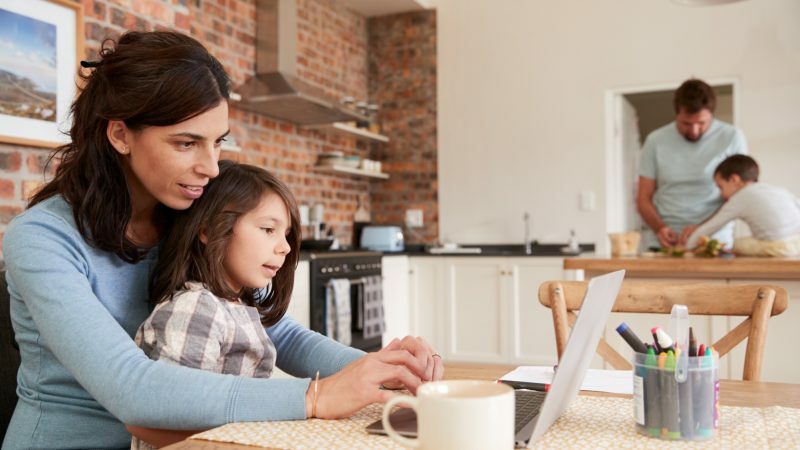 Workers with children were also more likely to have an option to work from home, with 59% being able to work at home, compared with 50% of workers without carer responsibilities. Over recent years we have observed a growing awareness of the causes and consequences of the work-family conflict, and the development of several policy initiatives to help workers balance their professional and family responsibilities. Even so, the work-life balance is still a pressing policy concern across European countries and more action could be taken to support work-life balance for working parents. The European Pillar of Social Rights highlights the importance of working practices and environments that allow people to fulfil both their professional and family roles. Harmony between work and home could be an important means of improving the wellbeing of both children and adults and promoting a more prosperous society at large.